In our digital world technology experts continuously come up with solutions to make our everyday lives easier. Need to share your pictures? There is an app for that! Need help remembering where you parked your car? There is an app for that! Need a ride to the airport? There is an app for that also. Technology, however, has not been able to figure out a way to help chronic pain sufferers yet. Luckily, in yoga tradition there is a tool for that! (Or rather a variety of tools for specific layers of chronic pain.) None of those by themselves will solve the problem, but once they are combined they can become very powerful in restoring function and quality of life. Why is yoga so effective for managing chronic pain? Because chronic pain is multidimensional and affects us on different levels of the system. Let’s do a quick review of the inner workings of the brain and how it responds and adapts to pain signals. 1. Your brain needs to assess every instance of pain from multiple angles (sensory, emotional, behavioral and cognitive) to decide whether or not it should be bothered by the pain signal and what kind of response is necessary (the neuromatrix of pain). 2. Because of the brain’s negativity bias it is wired to expect the worst and prefers to err on the side of safety by swiftly initiating a strong pain response. 3. For the purpose of efficiency the brain builds streamlined neuropathways for dealing with similar threats based on past experience and resorts to those for each instance of pain. 4. The problem is that the actual pain signals might get misinterpreted and jumbled up with our emotional and cognitive responses to them (blurred boundaries). Both actual pain and our emotional response to it get similar physiological treatment. 5. Strictly physical remedies for chronic pain ailments do not take into account the neuromatrix of pain or pre-established neuropathways, that’s why they can be ineffective. To be effective for managing chronic pain, the strategy needs to involve the physical body, physiology, mental assessment, emotional response and overall outlook on life. In the field of chronic pain management it’s called the interdisciplinary chronic pain rehabilitation program (CPRP). CPRPs usually include physical therapy to address the physical sources of pain, cognitive behavioral therapy to change patient’s response to pain, and medication to help overcome emotional reactions to pain. Guess what? In yoga we have our own CPRP and it’s called The Panchamaya Model. The Panchamaya model (also called Five Koshas) is a way to organize our thinking when it comes to five main layers of our systems: physical structure, physiological processes, the content of our minds, our ideas and attitudes toward our surroundings and our sense of connection to other people, society and the Universe. 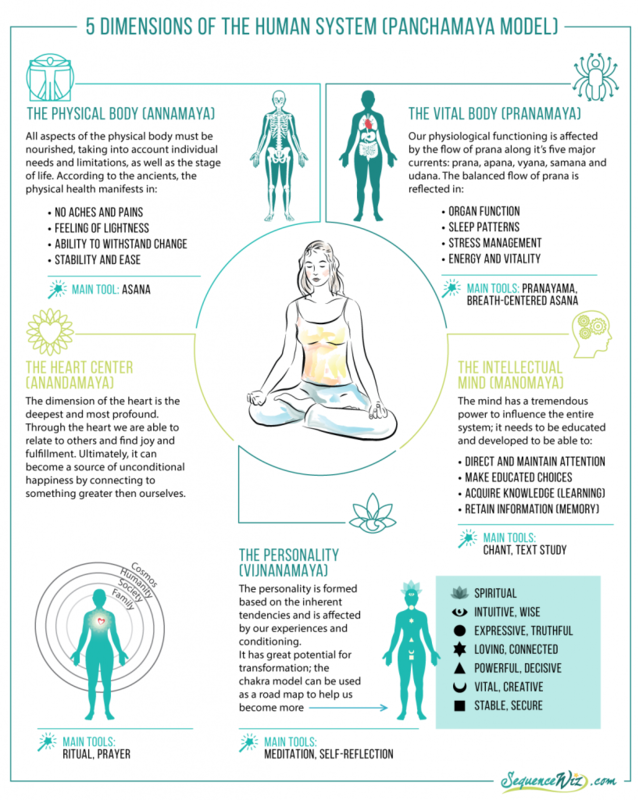 Yoga tradition has developed tools to bring balance and healing to each of those layers. The Panchamaya model is extremely useful when it comes to managing chronic pain, since chronic pain affects us in each one of those dimensions. Here is a quick overview of the five dimensions of the human system and the main yogic tools (practices) that give us access to each one of them. Next week we will begin our conversation on how to apply the Panchamaya model specifically to managing chronic pain. Tune in! This is a fantastic piece! I so look forward to every update you send out! Great to hear that Sally! Great article, I totally agree with this approach. Thanks! I’ve been really enjoying your articles and all of the helpful information you have been providing. I recently signed up for email subscriptions because I don’t want to miss a post! I am extremely interested in yoga therapy and the viniyoga style approach. Are there reading material (textbooks, reference books, etc) of any sort that you could recommend for personal reading? I would really appreciate it. Thank you! Hi Beatrice – I am so happy to hear that! A lot of my teaching comes from studying with Gary Kraftsow, so I would certainly recommend his books Yoga for Wellness and Yoga for Transformation. The heart of Yoga by TKV Desikachar is a classic, so is Yoga Therapy by A.G.Mohan. I also like to draw from all kinds of other sources – books, articles and studies about brain research, for example, and adapt it to yoga. I usually reference those additional sources at the end of the post. Hope this helps! I love this and am guided by this as I work with clients. May I suggest that mindfulness-based cognitive therapy is actually more effective for chronic pain relief then traditional CBT as we are creating a skill-set that is more about witnessing the pain and allowance, rather than attempts to change thought pattern around it. Thanks for another great conversation! Thank you for sharing this clear article! Olga, thank you, thank you, thank you for your wonderful work and generous knowledge sharing. I read every one of your posts and pass them onto my social media on a regular basis. Blessings on your work. This is SO INTERESTING!! It’s really helping me to explain to my students what is happening in their body and brain.